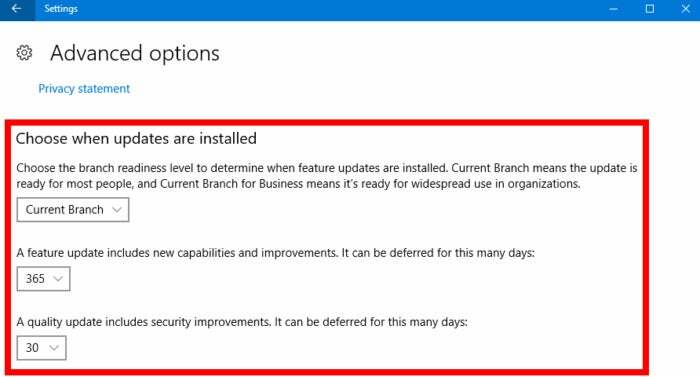 The Creators Update makes it much easier to delay feature and security updates than previous versions of Windows 10. Microsoft’s Windows 10 Creators Update is making it easier for users to delay updates delivered via Windows Update. Unfortunately, this tip only applies to anyone using Windows 10 Pro and up, Home users do not get the advantage of this setting. Get started by opening the settings app and go to Update & security > Windows Update. Then under the Update settings heading select Advanced options. On the next page, look for the heading Choose when updates are installed. The new update deferrals in the Creators Update. This is where you can choose to delay updates. You’ll find several key settings. The first is your choice of branch: Current Branch or Current Branch for Business. Current Branch is meant for people who are adjusting their schedule based on Microsoft’s regular mainstream releases. The business branch, meanwhile, is a slower release pace meant for businesses and large organizations. Below that are two other drop-down menus. The first allows you to specify how long new feature updates can be deferred, with the default being zero days. The menu lets you choose any number of days to your liking up to a full year (365 days). The second drop-down menu lets you defer quality and security updates for a maximum of 30 days. That makes sense since these rollouts are the usual stability and security patches that you shouldn’t go without for too long. The recent Shadow Brokers exploit dump, for example, included one exploit that was only patched in recent weeks. 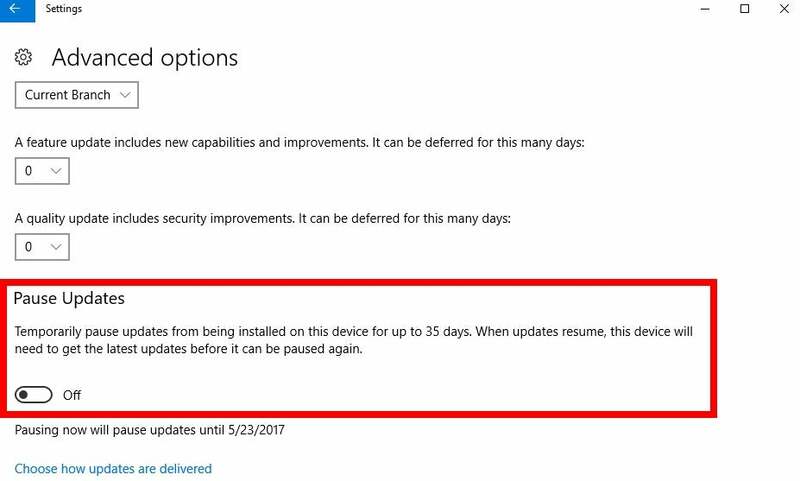 The Creators Update also has a global pause option that defers updates for 35 days. Scroll down to the next section on this screen, and you’ll see another method for deferring updates. Here there’s a single slider that lets you pause all updates on your device for up to 35 days. This setting is just a quick global stop for updates, which could be handy if you find out about a particular update you haven’t receive yet but that is borking other systems. Once you’ve set your update deferrals the way you want them, don’t forget to set up active hours on your machine. That way even when you do get updates, they won’t surprise you you with a reboot right before you need to use PowerPoint for a presentation.